This is the coolest way to watch the time pass since the hourglass. You can almost hear the light move as one digit slides into the next. Each transition is totally unique, so depending on the digit this involves one or more vertical segments sliding from right to left, or multiple segments moving in a counter-clockwise circle. You too can watch time glide by with little more than a 64×32 RGB LED matrix, a NodeMCU, and [Hari]’s digit transition code. It only costs about $25 to build, and you really can’t beat the quality of instruction he’s put together. Take a second or two and check it out after the break. If you prefer OLEDs and vertical transitions, there’s a clock for that, too. We’ve seen a proliferation of real-life video game builds lately, but this one is a jaw-dropper! [Tomer Daniel] and his crew of twelve hackers, welders, and coders built a Space Invaders game for GeekCon 2016. 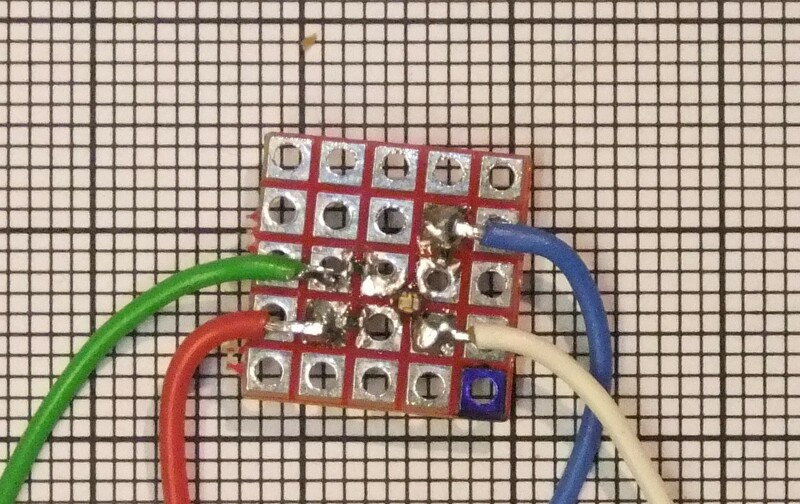 Hackaday.io contributor extraordinaire [al1] has been playing around with small LEDs a lot lately, which inevitably leads to playing around with large groups of small LEDs. Matrixes of tiny RGB LEDs, to be precise. First, he took 128 0404 SMD RGB LEDs (yes, 40 thousandths of an inch on each side) and crammed them onto a board that’s just under 37 mm x 24 mm. He calls the project 384:LED (after all, each of those 128 packages has three diodes inside). A microcontroller and the driver chips are located on a separate driver board, which piggy-backs via pin headers to the LED board. Of course, he had to use 0.05 inch headers, because this thing is really small. Of course, no project is without its hitches. [al1] bought LEDs with the wrong footprint by mistake, so he had a bunch of (subtly different) 0404 LEDs left over. Time for an 8×8 matrix! 192:LED isn’t just the first project cut in half, though. It’s a complete re-design with a four-layer board and the microcontroller on the back-side. And as befits a scrounge project with lots of extreme soldering, he even pulled the microcontroller off of a cheap digital FM radio. Kudos! We’re in awe of [al1]’s tiny, tiny hacking skills. Now it’s time to get some equally cool graphics up on those little displays. Quick–in a pinch, let’s have ourselves a giant RGB LED Matrix! As marvelous as it sounds, it’s pretty easy to forget that there’s a battle to be won against picking the right parts, debugging drivers, and sorting out our spaghetti wiring. Rest assured, [Hzeller] has done all of the heavy-lifting for us with a Raspberry Pi RGB LED Matrix Implementation that scales to multiple panels and runs on any Pi model to date! Offering 24-bit color at about 100 Hz for up to a grand total of 36 panels, [Hzeller’s] library is no slouch. The library enables customization of your panel arrangements, and a separate project (also [Hzeller’s] handiwork) makes this setup compatible with the pixel-pusher protocol as a network device. It’s certainly true that many of us have a thing for these displays, so you might ask: “have we seen this before? What’s all the fuss?” Like the others, the final product is a sight to behold, but [hzeller] and his implementation stands strong because of his phenomenal response to answering the question: how? In fact, almost more impressive is his comprehensive online documentation. Inside, [hzeller] details various hardware configurations for a custom number of panels or a particular flavor of Pi that drives them. He also provides references for pinout quirks and provides out-of-the-box software demos to ensure that anyone can bring this project to life. If a poorly-written or non-existent READMEs have made you shy away from building on an open-source project, fear not. From pinout quirks and out-of-the-box software demos, [hzeller] has covered all the bases and given us a project that folks of all levels of hacking. Perhaps the best part of this project is the span of the audience that can take something away from it. If you’re a seasoned Linux junkie, dive into the source code to get a good feel of mechanics of how [hzeller] pushes this project onto a single core in a Raspi-2 configuration. If you’re new to digital electronics, let this project be your moment to pick up a Pi, a panel (or four), and run, knowing that [hzeller’s] README is the only tome you’ll need to light up the night. We had the honor of soaking up some Nyan-Cat rainbows with a live demo at this year’s SuperCon.